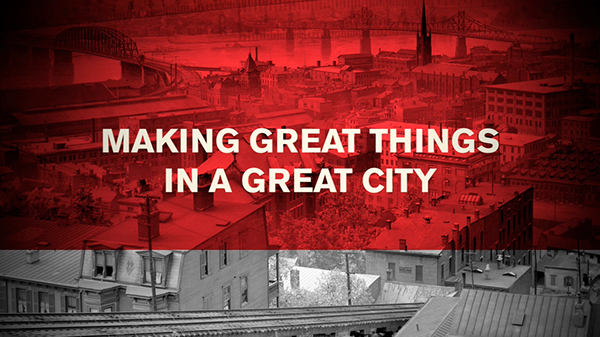 The First Batch program proudly celebrates Cincinnati’s roots as a manufacturing hub. Due to its prime location on the Ohio and Licking Rivers, Cincinnati became an ideal place in the region to receive and ship both raw and finished goods. The rivers provided high capacity transportation routes that flowed both north and south, kickstarting Cincinnati’s growth in trade and manufacturing. As opposed to cities like Pittsburgh with specialties in steel, Cincinnati manufacturers stayed diversified in both capabilities and scale, resulting in a sector that is both broad and agile. The First Batch program aims to celebrate this history and revive its prominence by connecting these manufacturers to local entrepreneurs.